Codenamed Coffee Lake, but more formally known as 8th Generation Desktop CPUs or the 8000-series, the latest additions to Intel’s desktop processor portfolio were unveiled to the public two weeks ago but were the worst kept secret in the component market for some considerable time beforehand. 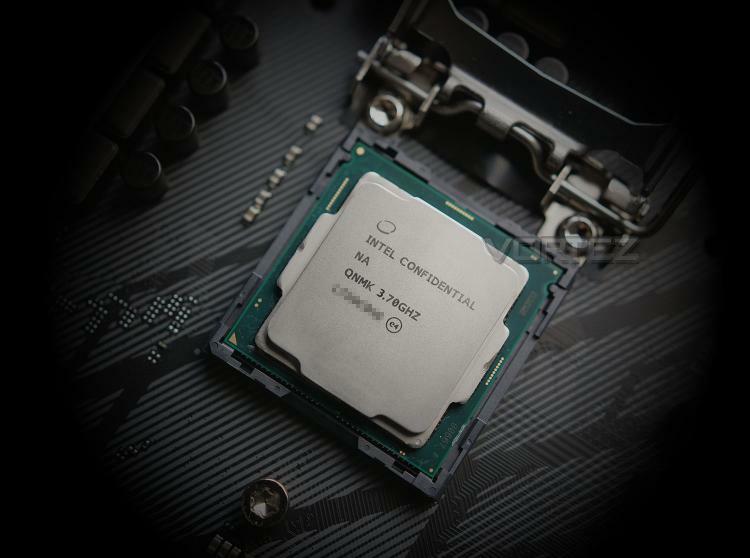 Whether as part of a hurried reaction to AMD’s Ryzen, or a stop-gap measure before Cannonlake in 2018, for the first time in generations Intel are choosing to debut a mainstream desktop processor in the Performance sector. So, what does this new platform bring? Simple: cores. Intel have taken up the gauntlet thrown down by AMD’s Ryzen CPUs and accelerated the launch of their 6-core mainstream designs, well ahead of the transition to an 11nm process node and Cannonlake microarchitecture. The Coffee Lake launch range is comprised of multiplier locked and unlocked 6-core and 4-core designs at prices from $117, with further SKUs on their way in the New Year. As with previously released mobile 8th Generation Core CPUs, Intel’s stated desire is to mark a step-change in performance at all product segments, and at the Core i3 level are accomplishing this by retiring dual-core designs. Yes, finally Intel’s mainstream won’t be shackled by having only two cores – that’s great news for regular consumers and budget gamers alike. Alongside the new CPUs is a new series of motherboards. In general you will likely be seeing Z370 motherboards for a while, a design necessary for overclocking the latest Unlocked processors. The first round of 300-series motherboards are revisions to the 200-series with a broadly similar feature set, but without any form of backwards compatibility despite a similar LGA1151 socket. Intel has stated that a number of optimisations have been made to Z370’s power delivery for the 6-core CPUs, and that certainly sounds plausible. Today’s review is of the Core i7-8700K, the Cannonlake flagship and highest-performance SKU at launch. Featuring six cores, each supporting Hyperthreading for a total of 12 simultaneous threads, at $359 it’s priced between AMD’s Ryzen 8-core/16-thread 1700 and 1700X. It’s also only a little over $20 more than the launch price of the i7-7700K, and so on paper is a big step forward in price/performance for Intel’s mainstream segment flagship. The i7 is currently the only Coffee Lake class to support Hyperthreading; AMD meanwhile support Simultaneous Multithreading earlier in their product stack. Further down the range is the unlocked 6-core i5-8600K, with smaller cache and slightly reduced base clock. No doubt mainstream gamers will be watching this results for this part like hawks. At the entry level point are a pair of quad-core Core i3’s, including a very exciting unlocked $168 i3-8350K. This could rival the Kaby Lake i5-7600K in performance, and potentially exceed it thanks to a slight up-tick in L3 Cache (from 6MB to 8MB), and is the most affordable unlocked Intel quad-core CPU launched in the post-Sandybridge era. 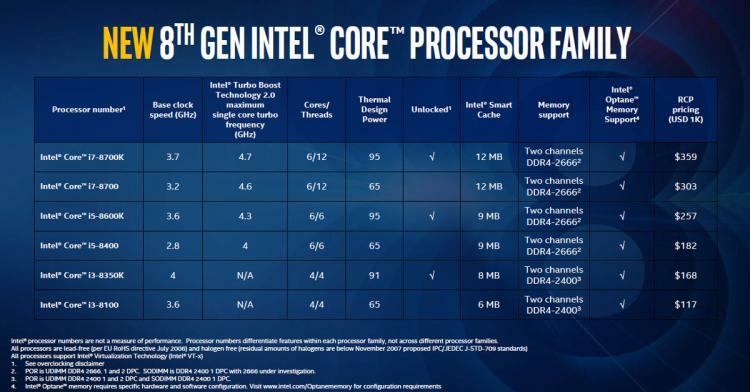 So, can Coffee Lake leave Kaby Lake in the dust and serve as a wake-up call to Intel's dormant core market? How about its chances versus AMD’s 8-core Ryzen behemoth? Read on to find out.